Headline inflation at 6.6% in December against 6.1% y/y in 2011, making 2012 the second best year in terms of inflation in over 20 years. Food inflation is 4.4% for 2012, tobacco up 21.2%. 6% crops failure due to drought in 2012 is taking the blame. Non-food inflation was 5.6% and services inflation at 5.4%. Meat and poultry led food inflation (+8.3%), brad and eggs prices up 6.2%. All good news for Irish exporters as food represents a strong component of our exports to Russia (see latest data here). Central Bank raised inflation target for 2013 from 2012-set 4.5-5.5% for 2013 to 5-6% set on December 29th. 2012 target set in December 2011 was 5-6% range. 2012 capital outflow stood at $56.8bn – the fourth highest yearly outflow since collapse of the USSR, with $9.4 billion outflows in Q4 2012, up on Q3 outflows of $7.6bn and Q2 outflows of $6.4bn, but down on massive $33.3bn outflows in Q1 2012. Net outflows were now recorded every year since 2007. Net outflows in non-banking sectors of economy amounted to $80.4bn in 2012. 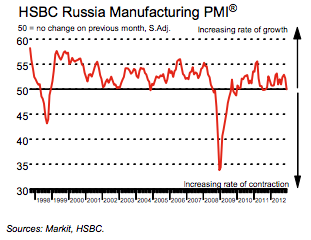 I do expect moderating capital outflows from Russia in 2013 and still expect strong capex in Russia. 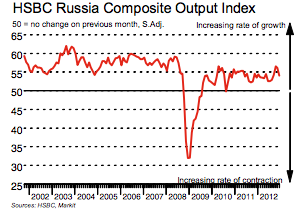 Ruble valuations are likely to remain strong despite the Central Bank interventions. At any rate, the CB is likely to moderate interventions in the currency markets as it moves to inflation targeting by 2015 from current FX targets. In 2012, OFZs returned 1.12% against 0.38% for Brazil, 1.36% for India and 0.03% for China.